They have a super website named. http://lamotorcyclist.com/ and here is our friend and co-creator of such websites take on the day we invited him and his Thruxton for a ride out with the 59 Club O.C. section. make sure you save their website as its a lethora of information on rides, events, functions, tips and anything Motorcycle related, for top news and future attractions, be sure to stop by their site as its very informative and the good thing is- its right up to the minute too. Cruising down an empty 105 at near ton up speeds towards Anaheim and a meet up with the newly incorporated 59 Club of OC, the pain of a 7am Sunday rise seems a distant memory. Morning fog off the Pacific Ocean makes my helmet and dark tinted visor choice seem a little crazy at the outset — visibility issues aside — but now with the sun peeking through all I can think of is how smooth the ride is on Thruxton999 … rear Ohlins, fork brace, steering damper … all welcome upgrades which handle the grooved concrete nicely at high speed. A predicted hour-long excursion East is quickly looking more like 40 minutes. The smell of the engine as it warms up — gas and oil mixed with a hint of leather – as well as the roar from my 2 into 1 Arrow, inspire me to crouch over the tank and pull a further twist on the throttle as I pass Crenshaw Blvd. The ton is done long before I have to bank onto the 605. The throaty roar of fourth gear at 7,000 RPM is ingrained in my psyche. Since my very first bike -– a stripped-down, caféd-out Yamaha Seca 400 -– I have always preferred the racer stance clip-ons offer, and the naked look of a traditional café racer. So a day out with the Ton Up boys just seems natural … surrounded by Triumphs, Moto Guzzis and the requisite custom Honda CB750, with riders sporting their newly badged, black Fifty-Nine Club jackets. 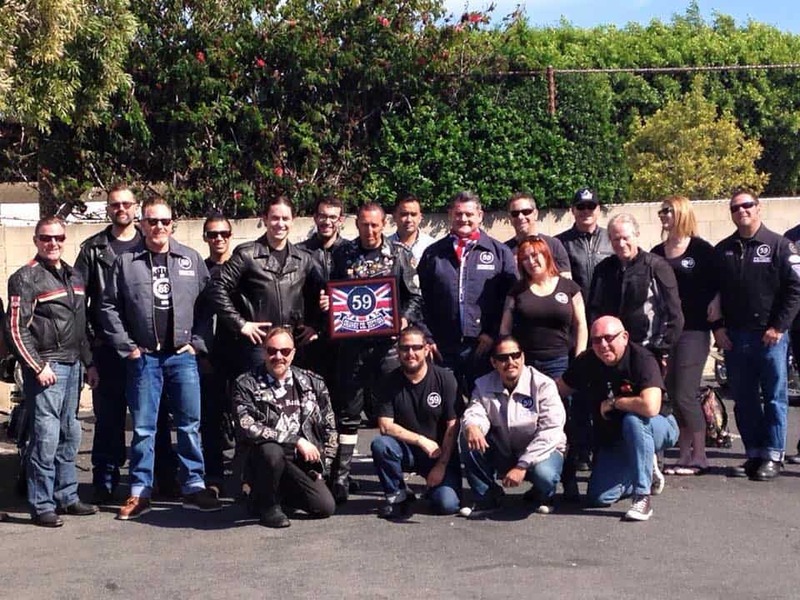 The meet, organized by café icon and builder Steve “Carpy” Carpenter — the newly confirmed OC 59 Club prez, attracts three highly modified Thruxtons, two Thunderbirds 900s, a T100, a Moto Guzzi V7 Racer and a CB750 café racer to the Aléa Cafe, a few warehouses away from Carpy’s own Anaheim-based garage shop, and a mere hop away from the 91. The ride –- a trip to Venice’s Deus ex Machina back in my own neighborhood, via Long Beach, San Pedro, and the beautiful coastal highway skirting the Palos Verdes peninsula -– promises some nice twists and even a few open stretches, a taste of the Long Beach Grand Prix course, and the luxury of crossing the Vincent Thomas Bridge. There’s something very comforting, and almost primal, when you hear the dull roar of a group of café racers firing up. But it’s also the camaraderie of walking around bikes and talking upgrades, modifications, the very philosophy of café racers, stripping your bike down to the basics for better handling and performance. For Carpy, the 59 Club is about nostalgia, but more importantly about that camaraderie, where members want to ride, help others and simply enjoy the moto lifestyle. If you like motorcycles, people and promoting the club in a positive way, then joining the 59 club is as simple as attending regular events over a six-month probationary period and then going through the traditional, now 55-year-old, initiation … passing a current or past president at the Magic Ton. Today’s excursion boasts some 90 F spring LA weather, and at least a few ‘Sunday’ drivers … no you don’t need to turn your wheel right before making a left-hand turn my mind mentally screams more than a few times as I go into avoidance mode around some four-wheelers. But then there’s the beauty of riding in small groups where people look out for one another … where traffic stops inspire off-the-cuff conversations … and passing other groups prompts a steady hail of acknowledging hand gestures. Along Palos Verdes Drive we ride up quickly on a couple dozen Harley tour bikes in bomber-like formation, but slow down to enjoy the breath-taking coastal view. We are all heading the same way, after all. Even the stop and start routine through Redondo Beach doesn’t quash any enthusiasm. As the ride wends to a close, we snake through beachside traffic along Vista Del Mar before the final Lincoln Blvd lane-splitting track to Deus in Venice. Much needed coffee, more bike viewing and talk, a Roland Sands sighting … Westside moto enthusiasts greet their OC counterparts. Riders come into the Deus parking lot … groups head out, greeted by moto officers ticketing those without DOT-approved headgear. But smiles prevail. 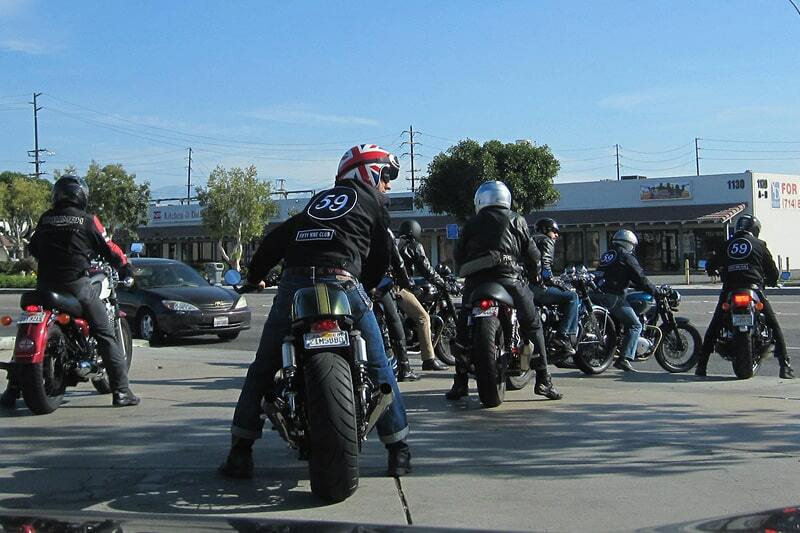 Just another Sunday in beautiful Los Angeles, the heart and soul of US motorcycling … and all before noon. This entry was posted in Blog and tagged 59 club, 900 efi, ace cafe, bonneville, brit iron, cafe racer, classic motorcycle, Events, LA motorcyclist, rockers, t100, thruxton, ton up, triumph.